We are thrilled to announce that SPCLC Program Assistant Christian McCleary has been chosen to attend the national invitation only MBK Rising! conference in California, a two-day convening over President's Day. This marks the 5th anniversary of the Obama Foundation, and will feature a roster of speakers including President Obama, Stephen Curry, John Legend, Karamo Brown, Rashad Robinson, and many others. 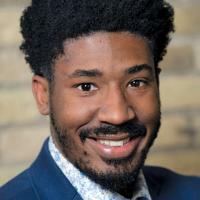 Christian will represent Minnesota and Maryland (where he used to live), as well as SPCLC, the Minnesota Literacy Council, and the Council for Black Male Success. The event will bring together in Oakland the growing network of MBK Communities, elected officials, cross-sector leaders, and young men of color and the organizations working hard to help them achieve their dreams. It kicks off with a Day of Service and Community Dinner on Monday, February 18 followed by two full days together for a mix of mainstage sessions, breakout sessions, and evening events. Congratulations to Christian on this hard earned honor! 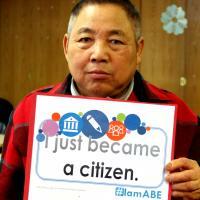 Tha Ko May, student at Vietnamese Social Services, achieves goal! SPCLC sponsored and participated in the first Guns Down Saint Paul Youth Summit on Saturday, November 10, 2018, at the High School for Recording Arts (HSRA) on University Avenue. 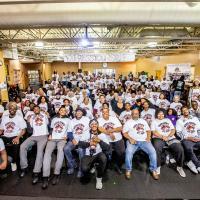 The goal was to work together as a community to end the gun violence in the Rondo community and other neighborhoods in Saint Paul. The first Guns Down Saint Paul Youth Summit will be held Saturday, November 10, 2018, from 8 AM to 3:30 PM, at the High School for Recording Arts (HSRA), located at 1166 University Avenue West, with the goal of working as a community to end the gun violence in the Rondo community and other neighborhoods in Saint Paul. Attendance is FREE; registration is the day of the Youth Summit. The first 50 youth and first 25 parents will receive a $50 gift card. Breakfast and Lunch will be provided to attendees. For additional information, please contact Dora Jones, dorajones@saintpaulmya.org or 651-222-7721. SPCLC is a supporter of the Summit. 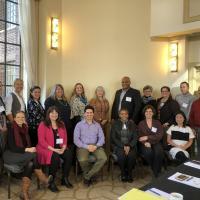 Rebecca Ryan (Saint Paul Public Library) and Tom Cytron-Hysom (SPCLC) represented SPCLC at an American Library Association meeting for the Advisory Committee on Library Services for New Americans, Oct. 22 in Chicago. The end result will be recommendations on best practices for refugees and immigrants.